Introduction: Fenwick, one of the pioneers of graphite rods produces the HMXS66L-2 for trout and bass anglers who enjoy using small lures and really want to savor the fight. Impressions: Fenwick produces a wide range of rods and the HMX line is near the center of their offerings. When I first received the S66L I couldn't help but notice how thin the rod was. I have seen rods this thin in 3 piece form. The other thing that immediately struck me about the rod was the unique rod seat that the HMX employs. 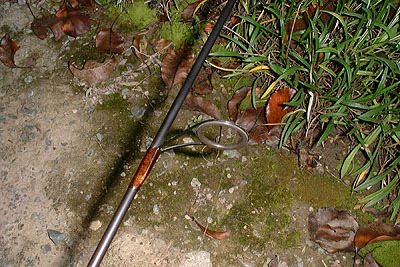 Fenwick's innovative design makes the rod look quite aerodynamic, as the reel is held firmly inside the front of the rod seat. 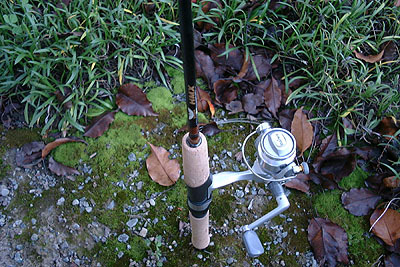 The S66L also makes use of an entire cork handle, and dresses it up a bit by putting a gold ring around their rod seat. The line rating for this rod is 4 to 10lb's, but I couldn't imagine putting 10lb line (or a reel that could hold 10lb line for that matter) on such a small rod. For all my tests I decided to use 6lB line. Real World Test: To test this rod in the field I decided to use this rod in 2 real world applications, Trout and Largemouth Bass fishing. On the first day I went to nearby Stevens Creek Reservoir for some trout action. In initial casting tests I was amazed that I could cast 1/8oz Acme Phoebe lures a good 40 feet. To push the limit even further I started casting 1/12oz Kastmasters....and the rod handled these with ease too! While rated to 1/8oz this rod seemed to easily fling even smaller lures with little effort. The ability to cast these tiny lures is a real plus. The rod is able to do this through a interesting power to flex ratio in the graphite blank. The lower 50% of the S66L is quite firm for a rod of this diameter, the next 30% of the rod is about half as firm, and the final 20% of the rod up to the tip is more then twice as flexible! So flexible in fact that I could bend the tip of the rod to the point where it could touch the blank! Catching trout on this rod is a real experience. The HMX graphite does a decent job of transmitting the vibration through the blank to the angler, so you can really enjoy the fight. Even the smallest Trout causes the rod to vibrate wildly thanks to the soft tip. While fun, the soft tip is tricky to get used to. When lifting fish out of the water I had to lift this rod 15 to 20 degrees higher then other rods just to position the fish in net-able distance, just to support the bending tip. In my next tests I used the rod for shore fishing at nearby Anderson Lake. While the lake doesn't have any trout, it does hold some good sized bass. Tossing Carolina rigged 4" Zoom Bait finesse worms was easier then I expected with this rod. Once again the ultra flexible soft tip seemed at home flinging lures of different weights. Prolonged casting with the S66L was easy, especially since I am accustomed to much heavier gear for Bass fishing. It finally got interesting when a Bass took my Zoom worm on a drop. I was ecstatic as I fought what felt like the lunker of my lifetime. When I finally worked the fish to shore I was surprised to greet a young bass of no more then 2lbs! Once again, fish size is extremely deceiving because of the flex in the rod tip. The S66L is sensitive but not to the point where it is easy to detect quick hits. 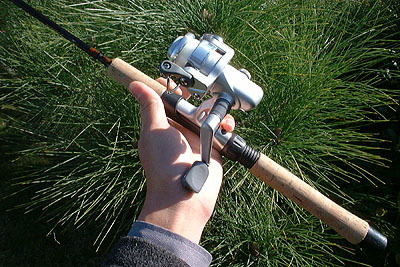 One disadvantage of this extremely quick rod is that even when bites are detected the angler must move quickly to accelerate the entire rod, not just the tip, to set the hook. The details on the HMX Graphite: Fenwick's HMX graphite is composed of 33 million modulus fibers. The result is a smooth and dependable feel with average sensitivity, but a good balance of power and flex. The HMX graphite while not being the most sensitive, is very predictable, and flexible enough to handle fish much larger then I expected. Conclusion: The S66L is a nicely balanced rod with almost all the right combination of attributes. The ultra fast tip and flex ratio of this rod makes casting tiny lures possible and fish fights exciting, but also takes some getting used to in terms of setting the hook. With that said, this is the "little rod that could" tackle small to medium sized fish of multiple species with confidence. With great flexibility in applications, at a decent price, the S66L is a balanced solution for anglers looking for a tiny rod that can do it all....well almost everything.